Made his debut like most IWRG rookies, working the undercard at Arena Naucalpan under a generic gimmick - Sureño de la Muerte. In 2003 had a streak of 15+ winning matches but it went nowhere. Eventually switched to a new gimmick that also went nowhere - Black Stone. 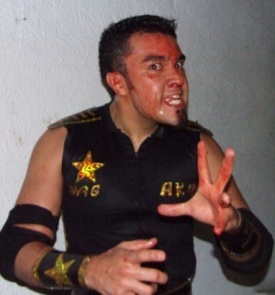 Seemingly disappeared until it was revealed he switched gimmicks and became AK-47, part of the Oficiales trio. The group has been wildly successful since their formation and continue to be a main part of any IWRG shows. This page was last edited on 3 March 2019, at 20:00.